E is for Elephant Alphabet Print is a great nursery & baby shower gift, as well as really sweet general: “I love you, my little Panda” token of affection. 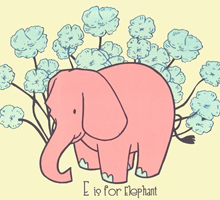 This hand screenprinted E is for Elephant is a part of a full Alphabet Print series designed for my friends’ beautiful first born daughter. 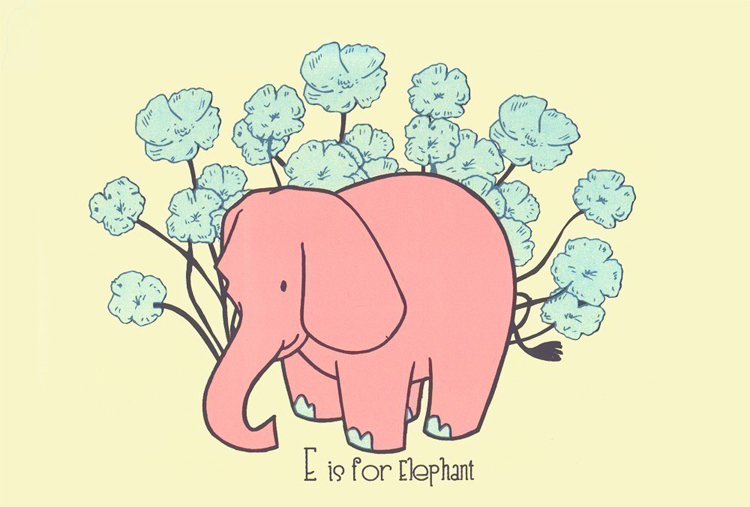 A pink elephant, of course! Trunky’s a three color wonder walking though the giant overprinted flowers of…Giant Flower Land. 3 colors with soft pink, dark grey and transparent baby blue inks (over the flower petals) hand-mixed and non-toxic water based silkscreen inks. Edition: Open, with each print hand signed, and titled. Size: 11 x 14 inches (27.9 cm x 35.6 cm) I love the deckled edges of Stonehenge so I leave the deckle edges at the top.